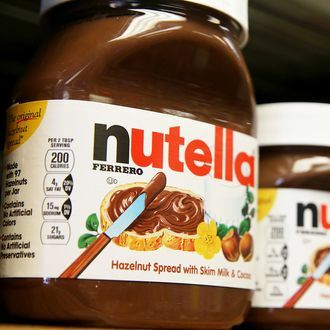 Nutella’s apparently super-sneaky Italian maker, Ferrero, has quietly changed the recipe for its marquee hazelnut spread. Writing on Facebook, an eagle-eyed German consumer-watchdog group says it discovered the scandal by analyzing the nutrition label on jars — the product appears to now contain 16 percent more powdered skim milk, the Hamburg Consumer Protection Center reports, and also be “lighter” in color. The group concludes that milk was probably added “at the expense of cacao,” adding that Ferrero wouldn’t be forced to legally disclose a change like that, although trying to sneak it by one of the industry’s most obsessive customer bases maybe wasn’t genius PR, as the company’s now realizing. In response to the post, Ferrero admitted that it did “fine-tune” Nutella’s recipe, explaining that the changes were just a couple of teeny-tiny “adjustments,” no big deal really, basically the kind of thing brands “regularly” do to their products. Routine or not, the tweaks ultimately affected not just Nutella’s milk-to-chocolate ratio, but also its sugar content, according to the Hamburg group: While sugar already accounts for the bulk of Nutella (55.9 percent), that amount has climbed further to 56.3 percent. One positive is maybe that total fat is down (from 31.8 percent before to 30.9 percent now), and Ferrero insists that, all told, the nutritional value is “similar” to the previous version’s. The ingredient switch is certainly cheaper for Ferrero. It’s never been incredibly transparent about how much of what things it puts into each jar of Nutella. Also, it’s a well-established fact that the U.S. version uses a slightly different formula than Italy’s, so Americans may have lucked out for now. Their thoughts and prayers can be with their poor European counterparts, who have frankly descended into a panic over the betrayal, and in some cases are vowing to never spread Nutella on toast again.